A CHAT WITH BUFFALO BILL. "Pray help yourself," said Colonel Cody to me, as I settled down in his tent at the Wild West to have a chat about the military competition ride between Vienna and Berlin with the champion long-distance rider of the world. "Pray help yourself," he said, as his black servant produced a box of cigars and a bottle of Bourbon. "Thanks, no Colonel, I am an abstainer; but may I assist you?" "Thanks, no," replied the Colonel. "I never drink—or, at least, never when on tour; as I find that by far the best way of keeping my redskins from 'fire-water' is to set them an example in this respect myself." "And of keeping yourself in good form, too?" "You are very much interested no doubt in the present long-distance ride between Vienna and Berlin?" "Why, yes, I have been following it very closely, and it seems to me a most creditable performance. Only the morning papers do vary so dreadfully in all their accounts, and even now I can't quite make out what sort of roads and weather the riders have had to contend with." "That would make all the difference, of course?" "Why, yes; and then it is not quite a fair test of endurance, either in men or horses, when the former have made arrangements for their comfort at certain stages all along the road, and their animals can be dosed with morphia and brandy as they go along?" "Well, that was the way that Captain Webb managed to swim our Channel, getting food and stimulants handed to him every now and then; but you've nothing of that sort out West, I suppose, among you rough-riders?" "You bet. But I have also known cases of stimulants being administered to riders and their horses, though only towards the end of their journey, when they wanted to put on a spurt. At the beginning this would be fatal to both." "I dare say you have remarked that many of the riders in the present contest used English thoroughbreds?" "Yes, and I am not at all surprised that many of them came to grief. Blood is a good enough thing in its way, but in a long-distance ride of this kind it cannot, as a rule, hold its own against wiry bone and muscle"; and here Buffalo Bill warmed up with real enthusiasm about he staying powers of his own Texas and Mexican bred ponies. "Do you think, Colonel, you could have cut the record yourself between Berlin and Vienna with one of these animals?" "Why, yes, I think I could—that is to say, if I had been in better form than at present. For I guess I haven't had any rest worth speaking of these twenty years back, and that's what takes it out of a man, even the hardest." "So you are a great believer in the staying powers of your own ponies?" "Well, yes; and I guess I have every reason to be so. That was pretty well squared, I reckon, on the racecourse at Manchester several years ago, when I laid a bet with some English gentlemen that I would ride ten miles on twenty of my ponies faster than any other man on the same number of English thoroughbreds. The English rider chosen was Mr. George Lathom, but I beat him by sixty-four yards, and I guess that was about the hardest twenty minutes' work I ever did, for that was all the time I took to do it, with some add seconds." "Ten miles on twenty ponies in twenty minutes was good; but you had a splendid training for that sort of thing as a pony-express rider in the Far West, hadn't you?" "Well, yes; but that was done differently. Before the days of steam and telegraphs, our mails from the Pacific Slope to the Missouri were carried by an uninterrupted chain of pony-riders, each of whom had to do about fifteen miles an hour, though I have known this rate to be frequently exceeded. For example, when Lincoln was standing for the Presidency, the election returns had to be conveyed from Sacramento to St. Joseph, a distance of 1,900 miles—and, mind you, the track was nothing like so good as the road is sure to be between Vienna and Berlin. Well, in the carrying of these mails, the average rate of riding was seventeen miles an hour, and you can thus tot out for yourself how soon the returns reached the Missouri. But on this occasion my own pace was only about fifteen miles an hour, as my part of the route lay through the Rocky Mountains, and had to be done in the dark, which made a tremendous difference." "But you have done bigger feats than this in the way of riding?" "Well, yes, for on one occasion I covered as much as 322 miles in one continuous ride, though not, of course, on the same horse, at an average speed of fifteen miles an hour, and mind you this was through hostile territory, too. I see that one of the Austrian officers has done the distance between Vienna and Berlin—which I say is about 435 miles—in a little over seventy-one hours, and on the same horse, including six hours for man and beast. I admit that this is a very fine performance for both, but then the Austrians, especially the Hungarians, are all very finely mounted. In the course of all my travels through Europe—and I have always had eye to that sort of thing—I have come across no finer and efficient-looking horses than those that are used for the Austrian cavalry." "But have you seen the Germans and their East Prussian breed of cavalry horses?" "Yes; but I think the Hungarians take the cake." "Well, Colonel, and so did you, if you will allow me to say so with your 320 miles continuous ride. But this was not your only feat of the kind?" 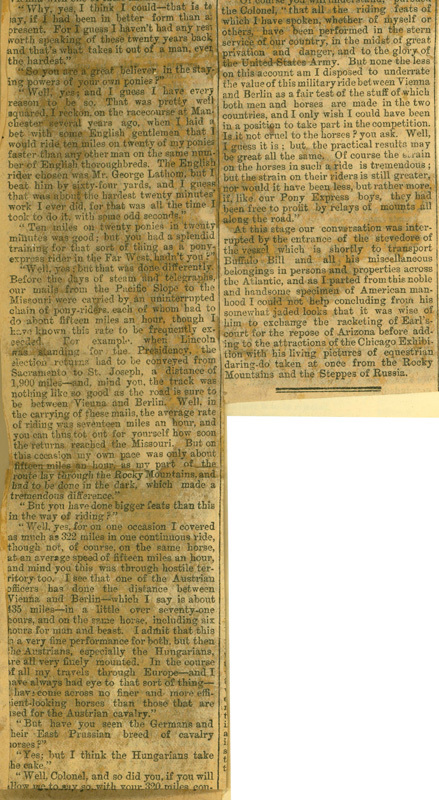 "Well, no; for on three different occasions, in the course of the same winter of 1869, I rode from Fort MacPherson to Fort Kearney—a distance of ninety-five miles, there and back—in twelve hours; while once, on the Platta I managed to cover 100 miles in nine hours forty-five minutes; and as for horse flesh, why bless you, I once extorted from General Custer, to whom I was acting as guide, expressions of the warmest admiration for a mule on which I had outridden him, and which he at first regarded with contempt as quite unequal to the task before it. The general himself, too, was mounted on a splendid charger; 'but never again,' he said, 'will I judge an animal by its mere looks.'" "And then again," continued Colonel Cody, with a generous desire to do justice to others, "it was quite common thing for some of our pony-express riders to do as much as a 100 miles continuous ride on relays of ponies, seeing that the further they went the more money they got. And then I must remind you that riding out West with its frequent detour owing to bad roads, rugged mountains, and bridgeless streams is a very different thing from what it is on the high road between two European capitals." "Precisely so; but, if I am not mistaken, General Sheridan, in his memoirs, also refers to one of your famous rides?" "Well, yes; the general certainly did me that honour. That was in the winter-campaign of 1868 against the Indians. I had just completed a ride of sixty-five miles from Fort Larned to Fort Hayes through a section of country infested with hostile Indians; and hearing that General Sheridan was in great straits for want of a dispatch carrier, I undertook the job—which led me, before all was done, a continuous dance of 350 miles—and in such weather, too, as I never wish to see again." "In less than sixty hours with several fresh mounts and a few hours' occasional rest; and I may add that his included an enforced walk of thirty-five miles, which I had to do owing to the bolting of my mule when I was watering it." "Well, Colonel, that mule deserved to be kicked." "My dear sir, kicking was too good for it; so, on coming up with it at last, after a five and thirty miles' chase, within half a mile of my destination, I gave it a bullet from my Winchester, and there an end." "Colonel, you did well. Treachery and untrustworthiness should always be avenged. But, tell me, the United States Cavalry must also have done some splendid feats in the way of riding?" "Guess you're right there. Beat the cavalry of Europe hollow. To go no further back, for instance, than 1879, General Merritt rode with a detachment of the Fifth Cavalry to the relief of Payne, and covered 170 miles in two days and a half, being accompanied by an infantry battalion in wagons, which much retarded the march. Single couriers had ridden over the same ground in twenty-four hours. On the same occasion a troop of the Fourth Cavalry did seventy miles in twelve hours, and it must be remembered that, unlike the riders between Berlin and Vienna, these American horsemen carried with them their ammunition, arms, and heavy packs. Again, in 1870, four troopers of the First Cavalry marched 140 miles over a very bad waterless road in twenty-two hours, including three and a half hours of stoppage for rest, while in 1880 Lieutenant Robertson, First Cavalry, took twenty-three and a half hours to cover 102 miles over a very snowy and heavy track. And then, too, I suppose you must have heard of General Guy Henry's regiment of mounted niggers, which in 1890 marched 100 miles in the night, fought an action at daylight, then rushed to the relief of our 7th Cavalry, and returned over the same ground after two days' continuous saddle-work, and not a single sore back among all their mounts." "Of course you will understand," pursued the Colonel, "that all the riding fears of which I have spoken, whether of myself or others, have been performed in the stern service of our country, in the midst of great privation and danger, and to the glory of the United States Army. 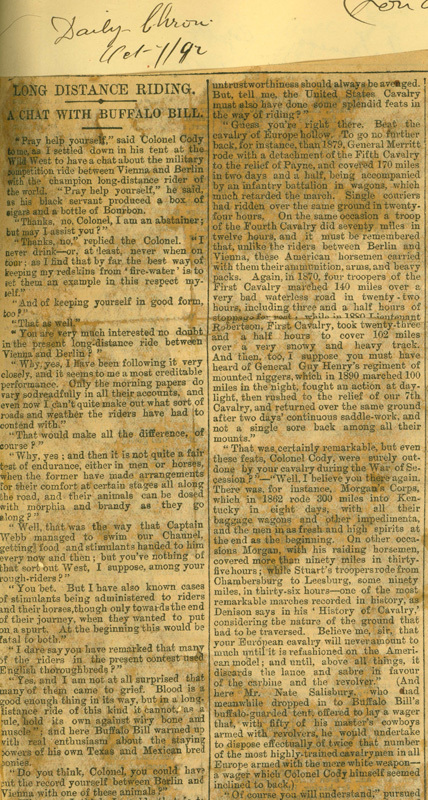 But none the less on this account am I disposed to underrate the value of this military ride between Vienna and Berlin as a fair test of the stuff of which both men and horses are made in the two countries, and I only wish I could have been in a position to take part in the competition. Is it cruel to the horses? you ask. Well, I guess it is; but the practical results may be great all the same. Of course the strain on the horses in such a ride is tremendous; but the strain on their riders is still greater, nor would it have been less, but rather more, if, like our Pony Express boys, they had been free to profit by relays of mounts all along the road." At this stage our conversation was interrupted by the entrance of the stevedore of the vessel which is shortly to transport Buffalo Bill and all his miscellaneous belongings in persons and properties across the Atlantic, and as I parted from this noble and handsome specimen of American manhood I could not help concluding from his somewhat jaded looks that it was wise of him to exchange the racketing of Earl's court for the repose of Arizona before adding to the attractions of the Chicago Exhibition with his living pictures of equestrian daring-do taken at once from the Rocky Mountains and the Steppes of Russia.